Bring your work with you or leave your cares behind. Situated on a 100′ wide channel in beautiful Key Colony Beach, this 3 BR/2 BA duplex home has a light and bright open floor plan. Built in 2001, the home has a fantastic large kitchen open to the living room and dining rooms. Stay cool in the air conditioning or open up the large sliding patio doors and enjoy the warm breezes. The home has the ‘preferred’ southeastern exposure for maximum comfort. 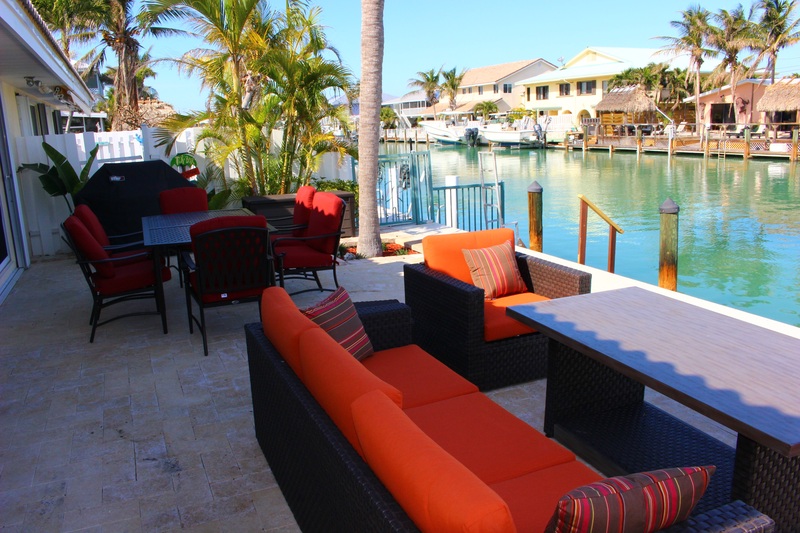 Sit by the palm trees on the deck or fish off the 37.5′ step-down dock. The clear channel is home to a wide variety of sea creatures. Clean your catch on our cleaning table and cook it on the gas grill. Take your ‘Catch of the Day’ to one of the local restaurants and they will prepare it for you! There is parking to accommodate up to three vehicles & a small boat trailer. Public parking lot nearby for larger trailers.The rental rate for 2018 is $1900.00 per week. Our family stayed here during the week of Christmas 2018. We were extremely happy with all the accommodations. House was extremely clean and well kept. Well equipped kitchen with all the necessities (Couldn’t find a knife sharpener 😬) The family loved it. Thermostat issue with the air conditioner was promptly taken care of with a return call and follow up from the owner. Patio furniture is nice and comfortable for outdoor dining and general sitting. We would rent this property again. great house very nicely equipped and great dockside four our boat. planning to rent next year!